Here at Tracker Fit we're experts when it comes to the installation of Lamborghini trackers. Our Thatcham approved installers are fully trained and qualified in the installation of Lamborghini trackers and have years of experience installing advanced tracking solutions of a number of Lamborghini models. One of our most recent Lamborghini tracker installations was on the stunning Lamborghini Gallardo. The owner of this vehicle wanted peace of mind that their car was secure and protected from theft. After discussing our customers requirements we advised that the Tracker Monitor be used to protect the Lamborghini Gallardo from theft. Tracker Monitor - the Lamborghini tracker installed, generates an alert if the Lamborghini is moved without your knowledge - Tracker then contact you to ensure your vehicle is secure. A covert transmitter is hidden discretely in one of several dozen places around your Lamborghini. There is no visible aerial or other identifying feature so the thief can't see it and won't know it's there. 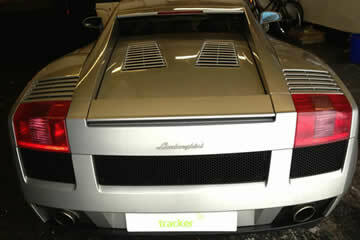 Tracker have their own, purpose-built, radio network dedicated to getting your Lamborghini back fast! Tracker has a dedicated police liaison team, which includes former police officers who work with all of the UK's police forces. So, if you're looking for a Lamborghini tracker to protect your prized possession look no further than the Tracker Monitor - a superb Lamborghini tracker giving you complete peace of mind.